The Pacific always fascinated me for its endless ocean water and beautiful places untouched by tacky tourist attractions. With a group of five friends we decided to sail to the Tuamotu and Marquesas Islands which are part of French Polynesia and loacted between South America and New Zealand. We departed from Porto Lucia in Salinas, Ecuador and after 19 days of sailing, 3500 miles of open water, numerous sunrises and sunsets, night skies lit by stars and many intense moments we finally arrived at Fatu Hiva. Fatu Hiva is the most southern island of the Marquesas Islands or Marquesas Archipelago. It was very emotional seeing land after so many days out on the open Pacific Ocean. Fatu Hiva is a volcanic island like all the other island of the Marquesas Archipelago and home to a couple of houndred haitants. The whole island of Fatu Hiva is beautiful with all the colourful flowers, clear waters and welcoming locals. Besides ourselves and maybe another lost navigator there were no tourists on Fatu Hiva which made this travel destination even more special.The Bay of Virgins is the most stunning bay in the world and a beautiful place to take in the panorama. From Fatu Hiva we continued our sailing trip around French Polynesia and headed to Hiva Oa, where the French painter Paul Gaugin found his last resting place. From Hiva Oa we sailed to Nuku Hiva where I got a tattoo on my foot, and to Ua Pou, our last stop on the Marquesas Islands. After our stay on Ua Pou we navigate another 500 miles to reach the Tuamotu Islands. 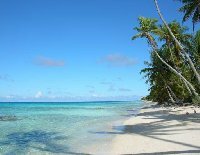 We arrived on the Fakarava Atoll and after a stay here we sailed to Papeete where we spend our last days on French Polynesia. The total sailing trip was amazing and especially the Marquesas Islands were stunning without the tourists. Here we met some really great people and tasted the real French Polynesia. The Tuamote Islands are a typical honeymoon travel destination and even if there are more tourists there is plenty to enjoy from the dreamy beaches to the local cuisine. Because we sailed around French Polynesia we could visit all the different atolls by sail boat which was just pefect. Tahiti, and especially Papeete, was the most chaotic place we visited. Papeeta has not so much to offer once you get out of your fancy hotel and there is quite a lot of traffic and chaos. Also we found the people less welcoming and the town centre less safe to walk around in. Did you enjoy Sailing the Tuamotu and Marquesas Islands and have you been on a holiday in Fatu Hiva, French Polynesia? What to do in Fatu Hiva: Visit the Marquesas Islands if you want a unique French Polynesian experience! Liked: Sailing around the Marquesas Islands! @LEMON TREE PASSAGE MOTEL-NEVER AGAIN!!! !